Yesterday rain all day; another chance to make another model from the plan book included in set 6A. This time the model is on page 6. A "Fortress Tower", model number one. I made a mistake in not following the drawing as close as I should have in stage "R-S". It is only a minor mistake and results in not using four number 34 stones. This could at any rate be an equally suited substitute. Thanks to Chris and his company, The Toy House, I received my 6A set yesterday. Now with the 4 and 4A set I already have; the 6A set gives me the equivalent of an 8 set. Saturday and rain all day, what a better time to start building. So here is a design from the booklet that comes with set 6A. Called a Swedish Fortress Tower, as found on page 12. I am puzzled by one step which seems to be missing. I am not sure if this is done to provoke thought or if this missing stage was omitted in error. It occurs at the end of stage "x-y". During our recent move, several of my card models were destroyed and so I have only photographs to remember them by. Two models that I will miss the most are the two models I am presenting here. 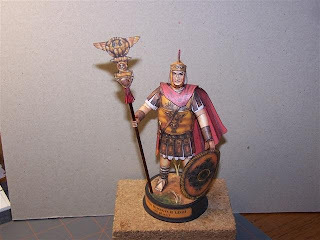 The first model, a Roman Centurion, is from a series done in a Czech Magazine called ABC. The magazine is published twice a month designed for young readers and each issue comes with one or two card models to cut-out and assemble. Some of the models can be very complex and may take several issues for the entire model to be complete. I miss not receiving the magazine any longer; but like most things, the price including postage gets so high that most people outside the Czech Republic can no longer afford to subscribe. The second model, the USAF Parasite Fighter, was designed to be carried under each wing of a B-36 or similar like aircraft. 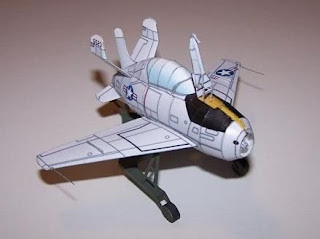 I lost the manufacturers name and place where I purchased the model and can only wish someone reading this might remember where it came from so that I could be able to buy the kit again. On July 19th, 2001 the city of Detroit celebrated it's 300 Anniversary. The Gala involved many different events throughout the city. Everything from events held at Detroit's Historical Museum to food and fair rides at Detroit's Riverfront in the Downtown area. Perhaps the most interesting was the parade of tall ships which visited Detroit for three days. Here are some pictures of three such ships. On the left is the "Pride of Baltimore" she is one of the graceful looking ships to be part of the parade. Ocean to find the New World. 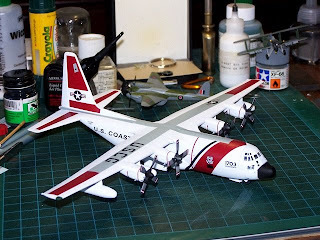 Today I share with you some pictures of my 1/144 scale model collection. 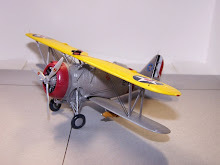 To the left is a model of the Fairly Swordfish biplane. This type of aircraft help sink the mighty German Battleship Bismarck. The model is made by F-Toys in Japan and comes almost fully painted and assembled. Adding the tail, some touch up paint here and there and she is almost finished. Of course rigging is not done and I used fine black plastic hairs from a paint brush for rigging which helps the appearance of the model. This next set of pictures represents the U.S.C.G. 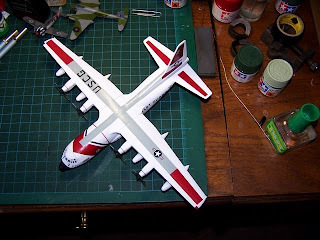 C-130 Hercules transport by Mini-Craft Model, likewise a 1/144 scale model. The kit is molded in white plastic. and contains a full set of Coast Guard markings decal sheet. The model took about a month to finish. Most of the parts fit with no major problems. I did modify the props so they would spin easily. After painting, I sprayed the entire model with Future Floor Wax and let it dry for almost three weeks before I attempted to decal the model. 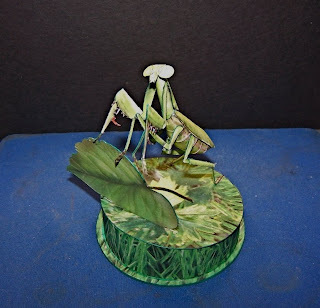 Many viewers have ask to see pictures of some of my card models. Here are some I have built in the few years. This model is by a German Company who's name escapes me at the moment. I scanned the original and doubled the size. 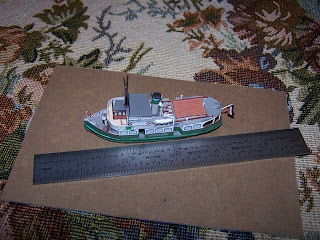 The original model is 1/250 scale. This model measures about 5 inches. So you can imagine how small the original model would be. The fishing net was made from Nylon netting used to make wedding remembrance bags. I dipped them in Black India Ink and let them dry before attaching to the spars. Small drops of white glue was used to represent the buoys. comparing it to the 6 inch ruler along side of the model. The ferry is from the 1920/30's and used in German. Likewise like the model above, I scanned this model also and doubled the size. I will publish a photo of this model at a later date. If you live in or around the City of Detroit, you probably know about the Diamond Jack Boat Cruises on the Detroit River. 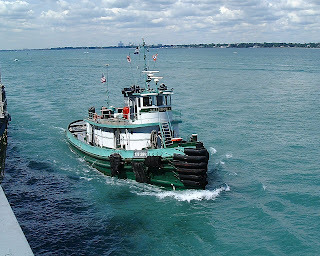 Every weekend all summer the Diamond Jack Boats take people either up river to the mouth of Lake Huron or downriver to the mouth of Lake Erie on cruises that last about 2 hours. Food snacks and drinks are available on board the boats. The cruises sail rain or shine. On one such cruise in the summer of 2000, I took these pictures with a Leica Digital Camera of a "Salty" (ocean going ship) while on a downriver cruise. 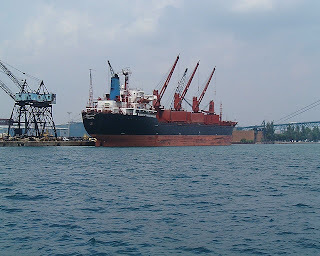 Here are some pictures of the "Stefania", home ported at Valletta, delivering steel to the Detroit Harbor Terminal. For those of us who were born and raised in Detroit, at least up to the 1960's; who could forget the Bob-Lo Boats? These boats took millions of people to and from an amusement park near the mouth of Lake Erie called Bob-Lo Island. The park was closed in the 1990's and sold for private development. This left the boats in Limbo. 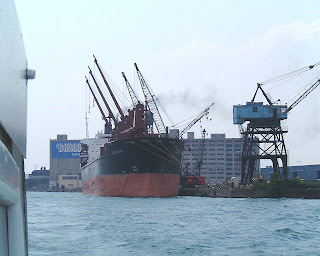 Both boats, the St. Claire and Columbia, were moved down the Detroit River to the Nicholson Drydock in Wyandotte, Michigan. There the boats were laid up and began to rot. In the early 2000's one of the boat's was moved by a group of enthusiast to another location for restoration. The picture shows how badly the Columbia has deteriorated. Taken in 1999 she sits along side her sister, the St. Claire, waiting here fate. Schula originally came from Mexico and had at least two owners before she was adopted by us from the local animal shelter. For this reason, Schula suffers separation anxieties and will go spastic when left alone in the car or at home unless she is in her cage. Loving children and adults alike; we often think she would rather be around other people over other dogs. We have found this to be true from our experience with her on visits to the local dog park. She will run with other dogs, but sooner or later she finds herself playing with the other humans instead. Here are two designs I came up with just playing around with some stones on the table. Here is a church I built last evening. Enjoy. I did not really get much of a chance to add as many buildings as I had hope to over the holiday weekend. I was side tracked thanks to a new used desk I happened upon. Bringing it home, making room, cleaning and setting up my computer on it took most of the day and early evening. I did manage to build one additional building from the plan set. Hope you enjoy it. I would recommend that you get hold of Gorge Hardy and get his cd's for your own collection. This holiday weekend, I have be going through a building frenzy. Here are two more models I've made using the plans in Anker 6 1/2 set. Before the weekend is over, I will probably add two or three more models to my Blog. I found this old Anker 6 1/2 set plan book while looking at one of the CVA cd's I purchased from George Hardy. There is a slight difference in the steeple of the church; I did not have enough of the right stones. Not knowing to much about these early sets, I found it interesting and a little bit of a challenge to make it look just like on original plan picture. If your not familiar with CVA's cd's, look at George's Home page on the bottom. You can order from him a lot of different cd's. When I first received my Anker Gernegroff Set, the idea came to me to duplicate the set in opposite colors. I contacted Chris Baldwin about getting stones. As usual he never lets me down and I was soon in possession of several stones. Also the small corner pieces and small steeple. It did not take long to decide to make my own set using my newly acquired stones. As I make card models as another hobby and sometimes sales, making my own box was a snap. Measuring the original, I cut, fitted, glue and sanded my new box. Then I gave it a coat thinned down Elmer's glue to protect the surface. I used cardboard about twice the thickness of the cardboard you find on the back of any tablet. Taking the original Anker box top, I scanned the image at 100% transfered the image to a drawing program, it this case, Microsoft Paint. Removed the Anchor and typed in my initials. Next the process of laying all the stones I had; hoping to fill the box. It took several different arrangements before I settled on the you see in picture below. Now I would never think of using the original set without including my personalized set. 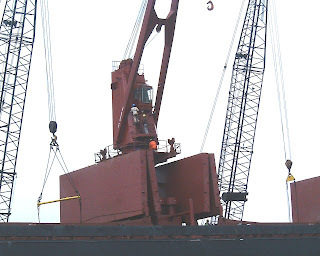 Checking many Zip disk in my inventory while converting them over to the Mac format; I found a few more ship pictures I would like to share with you. These were taken in 1998 while I was on the Diamond Jack Cruise Boat. The Diamond Cruise Line offers 2 hour cruises all summer long. These cruise can be up river or down river. The Down river cruise is picked up on the river front in Wyandotte. While the up river cruise was at downtown. It may have moved to a new location and you should check with the cruise company first. 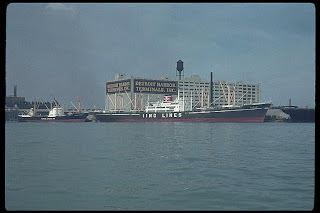 The First Picture is the Detroit Fire Boat in front of Cobo Hall, while the second photo is a Huron Cement Freighter docked at the Medusa Cement Company just East of the GM. It was a long hard process to decide if I should leave the World of Microsoft and the dreaded Windows operating system. As it turned out, I love my iPhone and what a better pair then to mate the iPhone with a Mac. Two days ago, I was up at the crack of dawn as usual, turned on the PC and went about getting my morning cup of coffee. When I returned to my computer horror of horror's, my computer refused to boot. After checking all sorts of things to get up and running it became plainly simple my computer was not going to submit. It did not take long to figure out the time had come to say good bye to the PC and hello to a Mac. For those who still work, I'm sure you have had those days when you clock watched and the minutes seem to pass like hours. This is what I had thought I left behind after I retired, only to find myself clock watching while waiting for the magic hour when the local Apple Store would open. It's amassing how four hours can somehow turn into an eternity. Well, now I have my Mac and even though it is a lot like windows, I still have the learning curve to conquer. Still hoping to find someone who can walk me through adding Google Adsense to this Blog. Today I have several items to add. First I have been building a 1/800 scale model of a Nuclear Power Plant with Pressurized Water Reactor. So far, I have finished the base, the Reactor Building and the Turbine Building see photos. I have been working on up-dating my site to improve the looks. I have added a few links and will be adding more soon. Next, I've added some photos that I took back in the late 1950's and 1960's. 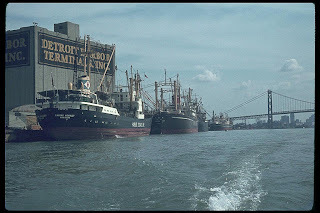 This was when the Detroit Harbor Facility was in full swing. 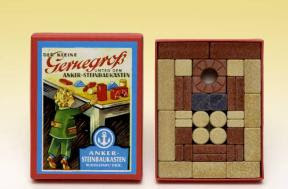 Today I am posting a couple of pictures of a small bridge built using the Anker Kleine Genegross Set. This is a small mini-set with 30 small stones. As with all small toys, this set is not designed to be used by children under three years of age. 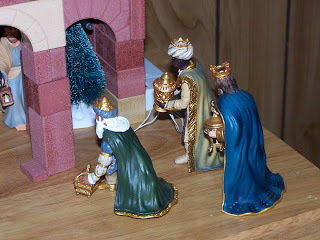 The set was designed for young children to play with and to introduce them to the art of building with stone blocks and to up-grade to the larger sets. The picture at the top is the Mini-set. The box measures approximately 4 x 5 inches so you have and idea of how small these stones are. Wow! How time passes when your having fun. This is my first post in several months. I have been busy building Plastic kits mainly Tamiya 1/48 armor kits. We have a new puppy her name is Schula and she is now 19 months old and a holy terror. Schula came from Mexico and loves heat, although related to the Pit Bull family Schula is a Stratfordshire Terrier who would rather play with people over other dogs. 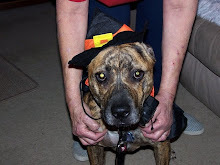 Her color is Brindle meaning she is brown with black strips all over her body. She loves to go the dog park and has a few friends she plays with. Rocket, Champ, LuShun, Bella, Shadow and Carli our her favorites. We take her to a local Dog Park in Mt. Clemens, Michigan. Other then that, I have always loved building things with the Anker Stone Blocks. These blocks date back to the 18th Century and were manufactured in Germany. After many many years, the company was re-opened and the blocks once again are being manufactured. I had several sets in the pass but was forced to sell almost all my sets when we went through some hard times. Now I have slowly started to re-supply myself with stones and sets. This about brings things current or at least close to current for now.